A blue chip inner-city car park investment in Melbourne owned by the Deague Group is said to have sold in an offer worth over $25 million. 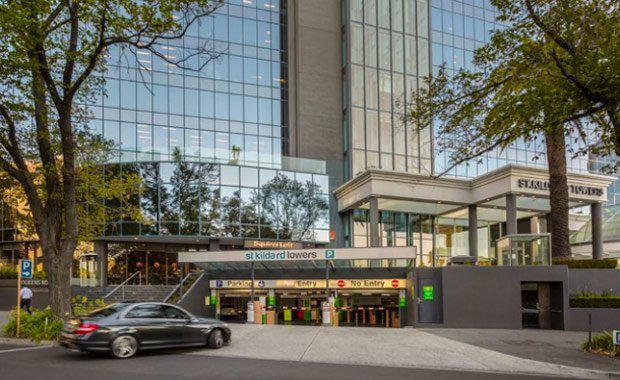 The 544-bay car park located in St Kilda Road Towers at 1 Queens Road has been marketed by CBRE and Knight Frank and covers 4377 square metres. It occupies six-floors of a 16-level office building that used be the TAB headquarters but was converted to strata offices. 1 Queens Road has 600 individual offices and caters for over 2200 office workers each day. According to The Sydney Morning Herald the Deague family bought the building for $11.8 million in 2001 and pursued the strata office development after considering a mixed-use development for the site overlooking Albert Park. A multi-level, 447-bay car park across the road is expected to be closed after Wuzhong International announced plans for a 19-level apartment building. This is further expected to add value to the Deague property. In July, the Deague Group paid nearly $25 million for a 4000 square metre site at 81-109 Moray Street, South Melbourne which has plans designed by architects Rothelowman for a $150 million office development. The Deague Group in August announced the sale of the management and leasehold rights of its Art Series Hotels to ASX-listed Mantra Group for $52 million.